Injuries in homes or businesses are sometimes caused by negligence. No place of business or home is perfect. But a business owner of any type has the obligation to inspect the business premises and keep them safe. A business should have a plan they follow to make sure that customers are kept safe, whether it is from debris on the floor or dangerous displays. This is called a “duty to inspect” and includes two types. The first type of inspection involves inspecting for transitory conditions such as rain, snow, and ice. If a parking lot is icy, for example, and putting down ice melt would make it less treacherous, the landlord or owner should do so within reason. A grocery store, to use another example, should make periodic inspections of its wares to make sure that slippery fruits, vegetables, or other substances have not fallen to the floor and created slipping hazards. 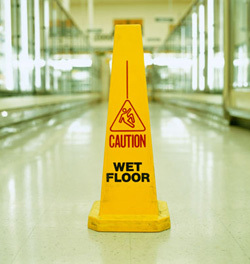 If aisles are wet and slippery, warning signs should be appropriately placed to notify passersby. The second inspection is for static conditions, involving construction, upkeep, or maintenance of stairs, ramps, railing, parking lot surfaces, lighting, etc. If someone is hurt by a defect in the premises because of an improperly constructed display, or an improperly designed stair or lighting, or improperly managed properties which allow visitors to be hurt (elevator accidents), or hurt because the owner has not properly maintained the premises, the owner is liable, or responsible, for the injury. Slip and fall cases are a common type of premises liability case. Call us for a confidential evaluation if you think that you have been injured or harmed by someone else’s neglect.